Federal President Frank-Walter Steinmeier was in China for a few days, and paid a visit to the Robotation Academy (officially opened in October 2017) in Foshan on the Friday. The HARTING Technology Group is a founding member of the Robotation Academy. Dr Ellen McMillan, General Manager Greater China for the HARTING Technology Group, talked to the Federal President and his accompanying delegation about the HARTING Technology Group’s contribution to digitalisation in China. “The smart manufacturing sector has sky-rocketed in China, and process digitalisation is increasingly important for this. HARTING can provide manufacturing companies with support for the monitoring and visualisation of production processes”, explained Dr Ellen McMillan. 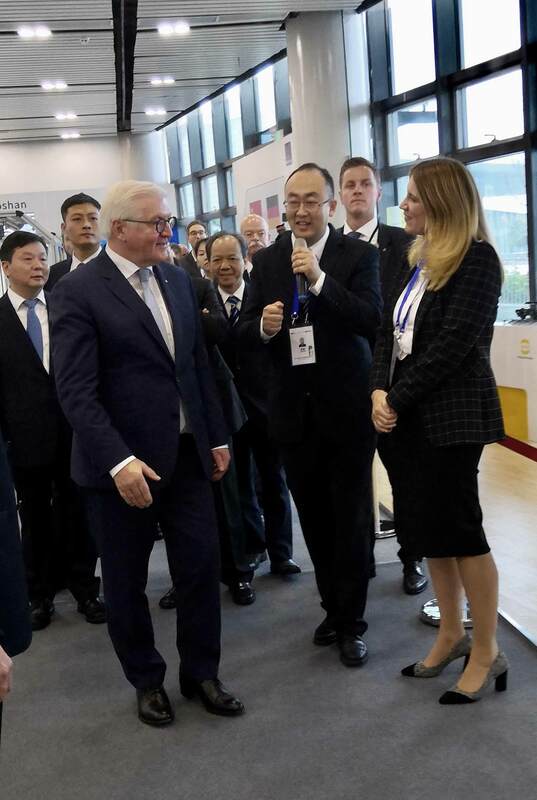 Federal President Frank-Walter Steinmeier greeted Dr Ellen McMillan (right), General Manager Greater China for the HARTING Technology Group, and learned about the HARTING contribution to digitalisation in China.